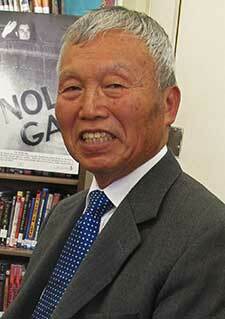 “I experienced the atomic bombing while living in Funairi, Hiroshima, about 2 kilometers from the hypocenter. “I was five years old at the time. We had a family of six. My older brother and sister were primary school students and had been evacuated. Another older sister and my mother were mobilized to work and so had gone into central Hiroshima. Only my father and I were at home at the time. When the atomic bomb was dropped, at the moment of the bright light, my father pushed me under a desk and placed himself on top of me to protect me. My father was blown away by the blast and his body was pierced by shards of glass and wooden rubble. Luckily the building next to our home was a brick factory and so our house did not burn. My father went to a nearby river to wash his body, and when he came back home the black rain began to fall. The city was full of horribly burned people. “My body became covered in blotches, and when I was in Grade 4 at primary school I was troubled with lung disease. After that, I somehow recovered and after I left high school I joined the construction industry development youth corps. When I was 20 years old, I left home and travelled by ship to immigrate to Brazil. My father was diagnosed with stomach cancer and my mother with breast cancer, and they both passed away. Because I was in Brazil, I was not able to meet with them at the end.